The Italian offensive launched against Greece on 28th October 1940 brought an end to the twenty-year Greek interwar period, forcing the country to become embroiled in global conflict. Together with Greek victories, the failure of the Italian attack at a time when the Axis powers appeared invincible was hailed with great enthusiasm in democratic countries, yet at the same time provoked German intervention. On 6th April 1941, the German army invaded Greece via the Bulgarian-Greek border, just when the main bulk of the Greek army was fighting on the Albanian front. Despite desperate resistance put up by Greek and British forces, the front collapsed, and by late April almost all Greek territory was under occupation. Crete's hour had come. In May 1941, German forces unleashed their assault on the island. The Battle of Crete had begun. 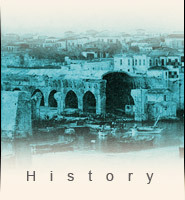 Heavy air raids targeted the main urban centres, obliterating a large part of Heraklion. The bombings were followed by mass drops of paratroopers, who had to contend with the local population in addition to Greek and British organised forces. The battles fought over the next ten days were fierce in the extreme, but the final outcome of the struggle was determined by the assailants' supremacy in the air. Thus the difficult period of Italo-German occupation extended to Crete. Heraklion was liberated in October 1944, but the last of the invaders did not leave the island until the German surrender in May 1945.